California's Dental Program For Low-Income Residents Is Struggling : Shots - Health News Millions of children and adults are eligible for subsidized dental care in California. But the state's program is underfunded and many families can't find a dentist who participates, a report finds. Fewer than half of the low-income children eligible for dental care in California actually get checkups or other treatment. California's dental health system for the poor is dysfunctional, according to a report by a bipartisan oversight commission. A more vivid description comes from Pedro Nava, the commission's chairman: "In California we have kids' teeth rotting out of their heads," he says. "That's utterly inexcusable." The program, Denti-Cal, ranks among state government's greatest deficiencies, according to the report released last week by the Little Hoover Commission, an independent oversight agency. One third of the state's population is eligible to use Denti-Cal for subsidized dental care, including more than half of the state's children. The department that runs Denti-Cal draws only part of the blame, according to the report. The Legislature, the governor's office, and the political culture of California share culpability for decades of neglect and strategic misdirection. California faces an "epidemic of tooth disease in which toddlers by the thousands have mouthfuls of cavities, children and adults are plagued with toothaches, whole counties have no Denti-Cal providers and families don't understand basic preventative dental care," the report said. Meanwhile, Denti-Cal has "thoroughly alienated the dental profession" with tangles of red tape and "reimbursement rates among the nation's lowest," the report said. "DHCS is strongly committed to providing access to quality dental care for our millions of Medi-Cal members, and Director Jennifer Kent has publicly stated that improving the Denti-Cal program is one of her top priorities." According to the department, about 44 percent of the children who are eligible to receive dental services — 2.5 million of them — received an annual dental visit in fiscal 2013-14, and about 23 percent or 1.5 million of eligible adults saw a dentist then. Lack of funding is one reason the program has failed to meet the needs of Californians, the report finds. That includes appropriations from the Legislature and low reimbursement rates. The state's reimbursement rates for the 10 procedures most frequently authorized for payment in 2012 averaged $21.60 — about "35 percent of the national average of $61.96 for the same 10 procedures in 2011," according to a 2014 report from the state auditor. Many dentists say they lose money on state-funded patients, so caring for them becomes a form of charity work. John Blake gave up a private dental practice in Long Beach to run the Children's Dental Health Clinic in Long Beach, where about 85 percent of patients are on Denti-Cal. Blake says he just wants to break even — the business is a nonprofit — and 25 percent of his overhead is paid for through donations and fundraising events. It's impossible to cover costs solely with the payments from the state, he says. "A lot of my colleagues used to take Denti-Cal, but it's not just the low rates, it's that the hassle of the system is so much worse than reimbursement. The hassle factor just got to be too much," Blake says. "They just gave up." The Little Hoover Commission report more formally addressed the hassle factor, noting that copious pre-authorizations for basic procedures are a major hassle, never mind a clunky billing system, much of it still paper-based, and a 22-page application form just to participate in the program. Dentist Camille Nishikawa, in Los Angeles, doesn't have those problems. She runs the QueensCare mobile dental clinic in partnership with USC Medical Center, which travels to schools in the poorest parts of LA to take care of children's teeth. The mobile dental vans are funded by grants; the program doesn't accept any money from patients or from Denti-Cal. Many poor people who are eligible for the program's benefits don't even know about it, Nishikawa says. "A lot of the community isn't aware of what they're entitled to," she says. "And if they do, they don't know where to go to find a dentist." Ruth Sandoval is one of those low-income people, a mostly Spanish-speaking mother of two in Los Angeles. She said she had no idea she and her two children could even get dental care as part of the Medi-Cal program. "It has been hard to find a dentist; it's very hard to find one," Sandoval said. She went to a clinic in Los Angeles for a different health problem and discovered a dentist on staff. She's grateful for that, she said, because she wouldn't have a dentist otherwise. "It's so important to us; we were so happy to find her there," Sandoval said. Most low-income Californians aren't that lucky. 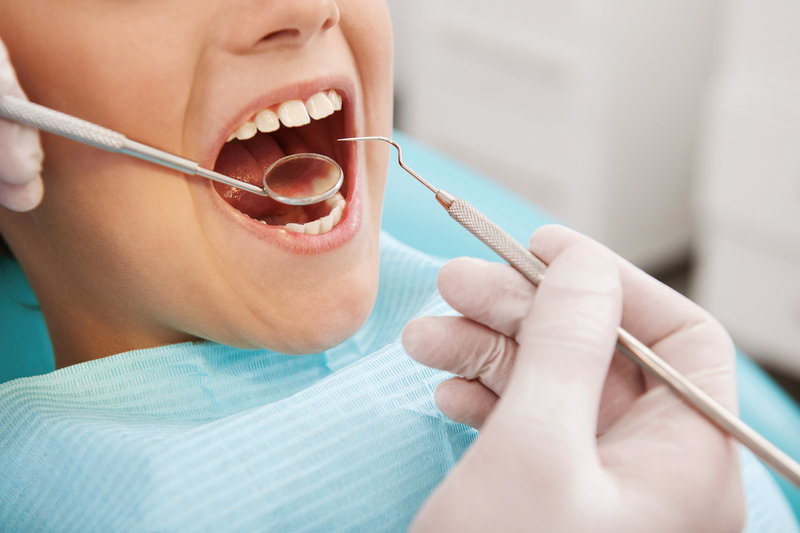 Fewer than half of the children eligible for dental coverage actually see a dentist, says Jenny Kattlove of the Santa Monica-based Children's Partnership advocacy group. People think of dental care as just getting a teeth cleaning, not as a health issue. "Look, when children don't get the oral health care they need, they suffer in pain," Kattlove says. "Untreated dental problems actually can lead to death; I don't know what's more health-related than that." Nava says access problems may only get worse as more Californians are added to the Medi-Cal rolls. In mid-May, an estimated 170,000 children in the U.S. illegally will become eligible for full Medi-Cal benefits, including dental care, and Nava worries that they won't get it. David Gorn is Capitol correspondent for California Healthline, a project of Kaiser Health News. This story was produced as part of a partnership between Kaiser Health News and NPR.